Over 17 million women have light bladder leakage, often due to menopause. During menopause, there is decreased estrogen which may contribute to thinning of the urethra lining, which can lead to a more frequent need to urinate, sudden urges, pain, and leakage, especially when one sneezes, coughs, or laughs. In fact, as much as 30% of American women age 50-64 has problems with urinary incontinence. Many use feminine care pads, such as those designed for use during a period, like Always, Kotex, and Stayfree, to treat the symptoms of LBL that they are exhibiting. Using fem care products rather than products targeted and designed for LBL is not as effective, and can lead to embarrassing leaks and odors. Many women find that when they try a product specifically designed for light bladder leakage, they make the switch. In fact, 43% of women who have tried Poise Hourglass pads have continued wearing them. Don’t just take our word for it, try them for a day. If you are experiencing light bladder leakage due to menopause, or any other cause, consider using Poise Hourglass to help manage the symptoms. Especially if regular sized incontinence pads simply don’t provide sufficient coverage for you, or twist, rope and leak. You can try a sample pack of 4 pads for just $3.49 handling. Poise Hourglass are available in 3 sizes/absorbencies. Poise is specifically designed for light bladder leakage. Poise was introduced in 1992, as the first pad for incontinence. They have been helping women discreetly manage their symptoms since. Poise Hourglass pads were introduced in 2012. They are designed specifically for managing light bladder leakage for larger women, and offer improved odor control. A shape that works with your body shape. The Poise Hourglass pad emphasizes a woman’s shape, and can help eliminate the problem heavier women often experience with pads, such as bunching, twisting, and roping, which leads to leakage. While not the perfect fit for all women, the Poise Hourglass is a better, more comfortable, and better protective fit for many. Specifically those that are over forty-five, and carry a few extra pounds. A feminine look: They have an hourglass or contour shape, and are wrapped in a purple paisley print, for a more feminine look and feel. 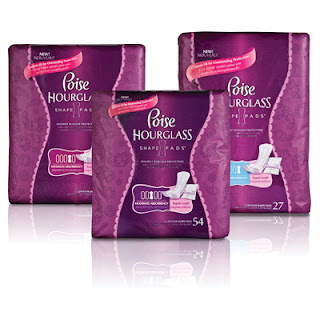 The right absorbency for your needs: Poise Hourglass pads come in three absorbencies to help you get the perfect fit. They are more absorbent than regular style Poise pads. They offer moderate absorbency, maximum absorbency, and ultimate absorbency. Learn more about new Poise Hourglass pads.